A few years ago, researchers at Bangor University looked into the social currency of a smile. Although many of us think that a smile is a smile, the scientists at Bangor discovered that people simply don't respond as favorably to a fake smile. Only genuine smiles truly work to engage others, communicate friendliness, or elicit a return smile. If you're self-conscious about smiling because your teeth are less than perfect, you're not alone. People who have yellowed, chipped, or crooked teeth tend to smile with their lips closed. They may even hide their mouth behind their hand. Luckily, there is a solution to this problem: Invisalign. Although Invisalign pictures are worth a thousand words, we invite you to check out the facts we've gathered here. Read on to learn how this cosmetic dentistry procedure can help you get back in the social game. In 1997, an adult orthodontic patient named Zia Chishti came up with the idea of clear aligners to correct a crooked smile. Since then, over three million people have used Invisalign to straighten their teeth. This method is a huge improvement over ugly, uncomfortable metal braces. As their name suggests, Invisalign aligners are clear, and as such don't attract attention. They are also much more comfortable than traditional metal braces. Is Invisalign Really Twice As Fast As Regular Braces? Yes, Invisalign treatment can be up to twice as fast as traditional braces! Over the course of your treatment, you'll receive a number of sets (upper and lower) of aligners, which you’ll change out each week. Each one is engineered to move your teeth incrementally. Most patients require between 18 and 30 different aligners. Treatment typically takes between four and eight months. 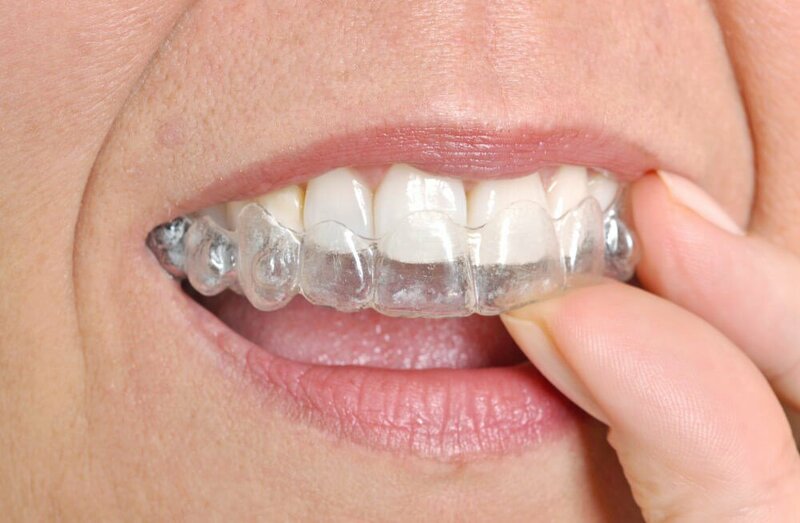 Invisalign clear aligners are worn at all times except when eating, brushing the teeth, and flossing the teeth. Does Invisalign Offer Any Health Benefits? Yes! When teeth are overcrowded, it's difficult to brush and floss them thoroughly. The crowding can lead to pockets where bacteria can breed and lead to gum disease, aka periodontitis, and gingivitis. Although these diseases may seem to primarily affect the mouth, they actually have a larger impact on the patient's overall health. Periodontitis has been linked to problems with the cardiovascular system, including a significantly higher risk of stroke and heart disease. So, by investing in your smile and choosing Invisalign, you're also making a healthy choice that may help you live longer! Anyone whose teeth aren't as straight and attractive as they'd like! These aligners do tend to work well for patients with lower teeth that are crowded together. But they can be used on any teeth to correct a variety of issues. These include overbites, underbites, crossbites, unevenly spaced teeth, or gaps between the teeth. If a patient desires an entire smile makeover, Invisalign is usually the first step. Once the teeth have been straightened using the clear aligners, your cosmetic dentist can provide whitening treatments to really make your smile sparkle! How Are the Invisalign Aligners Created? At dental offices with Itero CAD technology, the process starts with a 3-D digital laser scan of your teeth. Otherwise, models are made by hand using impression material (aka “goop”) that does not provide as accurate an image. They will also take panoramic x-rays and some photographs. These photos also will be used as the "before" part of your before and after Invisalign pictures. This information will be sent to the lab where your aligners will be manufactured. You will return to the dentist in a few weeks to get your first aligner set. After that, you will schedule visits every 4 to 6 weeks. At each appointment, the cosmetic dentist will evaluate your progress and fit you with a new aligner. Is Invisalign a Permanent Treatment? Yes, once your teeth have been gently adjusted into place by the aligners, you will no longer have to wear the aligners. However, you will need to wear a retainer at night time to maintain your teeth's alignment. Do the Aligners Require Any Special Care? Not really. You will remove the aligners to eat, brush, and floss. During those times, you should place them in a protective case, which the dentist will provide. Once a week, you should soak the aligners in a cleaning solution. Your dentist will explain this process thoroughly. She will also share with you some other tips and tricks for cleaning your aligners. What’s the Cost of Invisalign? Does Insurance Cover It? Having straight, even teeth that are easier to brush and floss does lower the patient's risk of gingivitis and heart disease. Therefore, if a patient has dental insurance specifically covering orthodontics (and few policies offer adult orthodontic coverage), then dental insurance can help offset some of the cost of Invisalign. Thus, it isn't usually covered by dental insurance. For teens though, it’s more likely it will be at least partially covered by insurance, up to the amount they would pay for regular braces. We will be frank: Invisalign isn't an inexpensive treatment. It costs more than traditional metal braces, but that's to be expected -- simply because the Invisalign treatment is far superior in just about every respect. Almost every Invisalign patient considers this treatment to be an investment in their health, appearance, self-esteem, and confidence. Read some of the testimonials and reviews we've received from satisfied Invisalign patients. They are almost universally happy to have chosen this treatment. If you have concerns about the cost of Invisalign, talk to us! We do offer payment plans. We'll be happy to explain your options to you, so you can begin your journey to a whiter, brighter, straighter smile! The Invisalign pictures speak for themselves. Take a look at our photo gallery to see what we mean! Contact the experienced, professional, and compassionate staff at Dallas Laser Dentistry today. Whether you need a complete smile makeover or only want to straighten your teeth, schedule a free smile consultation. During that consultation, we will answer any questions you might have and explain everything in detail.